The picture that you see above is that of a DAO molecule. The 'D' stands for Double, the 'A' stands for Antiparallel and the 'O' stands for Odd. This complex is made up of four DNA strands and for clarity each one of them is colored red, green, blue and yellow. The strands cross over at two places and there is an odd number of half turns in the helix between the two cross over points. This nomenclature was first devised by Nadrian Seeman whose group is at New York University. You can find a much clearer picture by clicking here.This molecule has four "sticky" ends, two at either end. 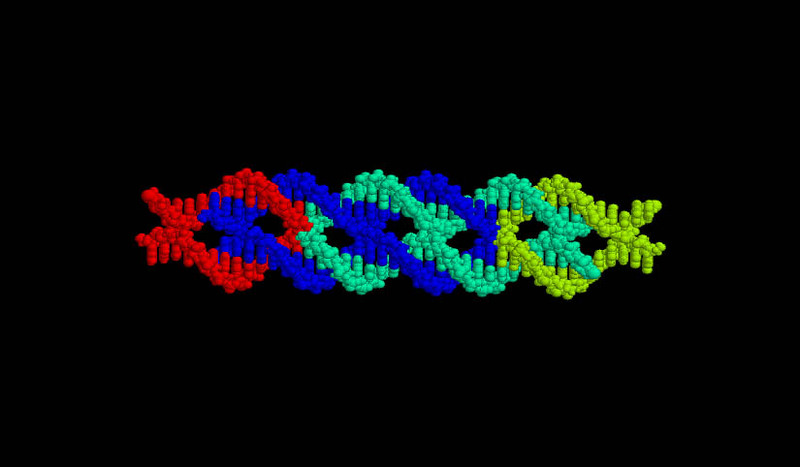 These sticky ends are nothing but single stranded DNA, each one five bases long, and each one a different sequence. One could imagine another DAO molecule coming in the vicinity of the first one and if the sticky ends of the second DAO is Watson-Crick complementary to the first one then one would expect the two DAO molecules to attach and from a two dimensional lattice. Such an experiment was carried out by Winfree et al. and is outlined in their 1998 Nature paper, entitled, "Design and self-assembly of two-dimensional DNA crystals". Erik Winfree's lab at the California Institute of Technology has some really cool images of such lattices.